India celebrates the 150th anniversary of Swami Vivekanand, the monk who influenced Gandhi and Nehru and helped shape modern India. Hindus across India and the world are celebrating as this year marks the 150th birth anniversary of Swami Vivekanand who has shaped modern India. Born in 1863 the Swami Vivekenand was remarkable by many standards, in his short time on the world stage, he accomplished more than most in a lifetime, dying before he was 40. Highly educated he was not always a religious man but came to be, almost against his will when he met the Kali worshipper and 'mad man', as he called him, known as Ramakrishna. Despite his own resistance he was drawn to the man who would become his guru. Much before Gandhi, Vivekanand was outspoken on the need to galvanise the people of India for independence from Britain. He predicted that with the collective might of all it would take 50 years to get the British out, and indeed it seems it took that long. Mahatma Gandhi and the first Prime Minister of India, Nehru, would be greatly influenced by his thinking. There are now 170 Ramkrishna Missions, named after Vivekanand's guru in India, and several others around the world. The monks, both male and female work setting up medical centres, hospitals, schools and even a university, to lift people out of the cruel poverty that plagues India's rural areas. Hailed as a 'man of our times' today, the most worrying facet of Vivekanand is how he is being co-opted by politicians from both sides, who have adopted his message for their own end and of the need to become 'Hindu'. Inevitably he means something very different to what Vivekanand meant all those years ago. 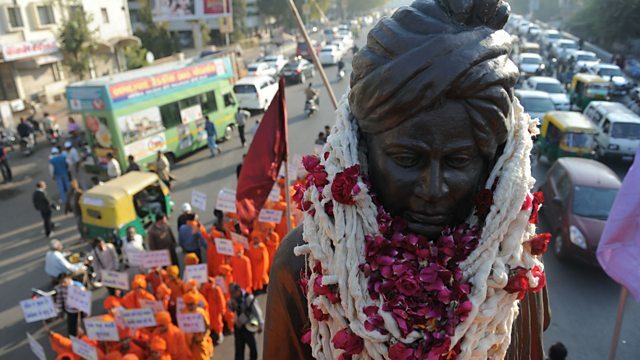 Sunita Thakur investigates who the Swami is, and why 150 years after his short life came to an end, he is still so important to Hindus who dress as him and decorate his statue. Plus why his philosophy is so magnetic for politicians as they shape a 21st Century India.